The bright and bustling city centre, located around the beautiful Belfast City Hall, is somewhere you could spend a lifetime exploring. With all of the usual attractions, such as shopping centres, busy high streets and a vast selection of restaurants and bars, venturing away from the crowds can be incredibly rewarding. Independent cafes, bars and restaurants offer experiences you will not find anywhere else, and niche shops such as Fresh Garbage or Atomic Collectables create very different shopping experiences. Belfast nightlife is also a lively scene, especially at weekends, with plenty of bars to suit all price ranges across the city centre. Across the River Lagan on the south side of the city centre, Belfast's Titanic Museum is not something that should be missed out on. Detailing the construction of the RMS Titanic (close to the site of the museum) and documenting it's a short journey to the middle of the Atlantic via Southampton, interactive displays and a short cablecar style ride bring the tale of the ill-fated ocean liner to life. The museum also has a selection of different restaurants in a small food court, as well as a large gift shop. There is ample on-site parking available, and it is easily reached by public transport. Impressive and imposing, the Cavehill sits to the north of the city centre and offers an experience you wouldn't normally find in many cities of Belfast's size. Situated in its own country park, the Cavehill is an easy hike offering stunning panorama's over the city and beyond, with the Mourne Mountains being visible on a clear day. To make the most of it, head out on a clear day and bring a picnic! Looking to get your High Street fix? Victoria Square shopping centre is a multistory shopping centre and food court offering everything you would expect from a modern city mall. Topshop, H&M, River Island, House of Fraser and many more are located in the outdoor, covered centre, and restaurants are dotted around on various floors. Here, you can eat at Five Guys, Wagamama's, Cosmo World Buffet, Nando's, Pizza Express and Yo! Sushi - something to suit anyone's taste. 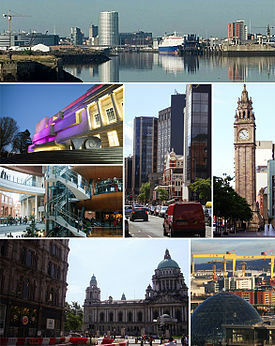 Additionally, Victoria Square is topped by a glass dome on the top floor, giving visitors a full 360° view of Belfast. Located next to Queens University just out of the city centre, Belfast's beautiful botanic gardens are a fantastic and free experience. Dating back to 1828 and set on 28 acres of land, the gardens feature an impressive glasshouse, which is home to many exotic tree and plant species, and a tropical ravine. The Botanic Gardens are also used as a venue for concerts, festivals and other events, so keep an eye out around the time of your visit to see if you'll be able to catch any interesting events while you're visiting. Feel like you've done all the big tourist spots? Here are a few more ideas to fit into your trip! - Again, if your budget allows for it, consider hiring a car and heading out of town to see what else Northern Ireland has to offer. Game of Thrones fans will recognise landmarks such as the Dark Hedges near Ballymoney, and on the north coast, the Giant's Causeway is well worth taking time to see. - Depending on the length of your stay and travel itinerary, a trip down south to Dublin, capital of the Republic of Ireland, is pretty quick and easy. From £17 (when booked online) travellers can take the 2hr20 journey to the vibrant southern capital.